I am not one to follow trends or jump on bandwagons. Actually I am usually the opposite. If it's popular then I have a natural aversion to it. I guess that is the hipster within. Moving on... The hashtag #100happydays kept popping up in my Instagram feed. I didn't know what it meant, but I was glad they were happy. 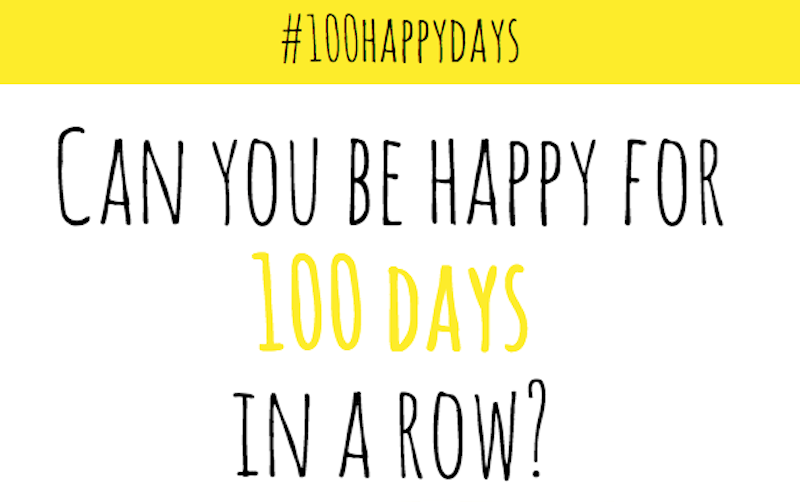 Then Elsie from A Beautiful Mess posted that she was going to start the 100 Happy Days challenge. I was thoroughly intrigued. So, I looked it up. SOLD! You had me at "better mood". Honestly, I am hesitant to start this challenge. In college, everything made me smile from the birds to the clouds to the shirt I was wearing that day. Life happened and the natural pessimistic emerged and I am having trouble putting it away. Also, I am extremely task-oriented and am concerned that I will just flat out forget to take a picture of whatever made me smile. According to the site, 71% of participants don't actually complete the challenge. That's a big number. But, guess what? If it were easy then it wouldn't be a challenge. Obviously, I need this. I start tomorrow! I would love for you to join me on Instagram. To start your own challenge, go here and sign up. It serves as extra accountability. Plus, you will receive a 100 page book with your 100 photos when you finish. It would make me happy to see what makes you happy! Please comment below on your choice of social media platform with your username. I would love to follow along in your challenge!